Moses was told to consecrate the people. This meant getting them physically and spiritually ready to meet God. The people were to set themselves apart from sin and even ordinary routine in order to dedicate themselves to the God. The act of washing and preparing served to get their minds and hearts ready. When we meet God for worship, we should set aside the cares and pre-occupations of everyday life. Use your time of physical preparations to get your mind ready to meet God. 8 The people all answered as one: “Everything that the LORD has spoken we will do.” Moses reported the words of the people to the LORD. 18 Now Mount Sinai was wrapped in smoke, because the LORD had descended upon it in fire; the smoke went up like the smoke of a kiln, while the whole mountain shook violently. 1 On the third new moon after the Israelites had gone out of the land of Egypt, on that very day, they came into the wilderness of Sinai. 2 They had journeyed from Rephidim, entered the wilderness of Sinai, and camped in the wilderness; Israel camped there in front of the mountain. 4 You have seen what I did to the Egyptians, and how I bore you on eagles’ wings and brought you to myself. 7 So Moses came, summoned the elders of the people, and set before them all these words that the LORD had commanded him. 11 and prepare for the third day, because on the third day the LORD will come down upon Mount Sinai in the sight of all the people. 12 You shall set limits for the people all around, saying, ‘Be careful not to go up the mountain or to touch the edge of it. Any who touch the mountain shall be put to death. 14 So Moses went down from the mountain to the people. He consecrated the people, and they washed their clothes. 16 On the morning of the third day there was thunder and lightning, as well as a thick cloud on the mountain, and a blast of a trumpet so loud that all the people who were in the camp trembled. 17 Moses brought the people out of the camp to meet God. They took their stand at the foot of the mountain. 19 As the blast of the trumpet grew louder and louder, Moses would speak and God would answer him in thunder. 20 When the LORD descended upon Mount Sinai, to the top of the mountain, the LORD summoned Moses to the top of the mountain, and Moses went up. 21 Then the LORD said to Moses, “Go down and warn the people not to break through to the LORD to look; otherwise many of them will perish. 25 So Moses went down to the people and told them. When Abram learned that Lot was a prisoner, he immediately tried to rescue his nephew. It is easier and safer not become involved. But with Lot in serious trouble, Abram acted at once. Sometimes we must get involved in a messy or painful situation in order to help others. We should e willing to act immediately when others need our help. Also, we read in the end verses that Abram did not accept anything from the king of Sodom. He choose to reject it for more important reasons- he didn’t want the ungodly king of Sodom to say, “I have made Abram rich.” Instead, Abram wanted him to say,, “God has made Abram rich. In this case, accepting the gifts would have focused everyone’s attention Abram or the king of Sodom rather than on God, the giver of victory. When people look at us, they need to see what God has accomplished in our lives. When Abram heard that his nephew had been taken captive, he led forth his trained men, born in his house, three hundred eighteen of them, and went in pursuit as far as Dan. Then he brought back all the goods, and also brought back his nephew Lot with his goods, and the women and the people. 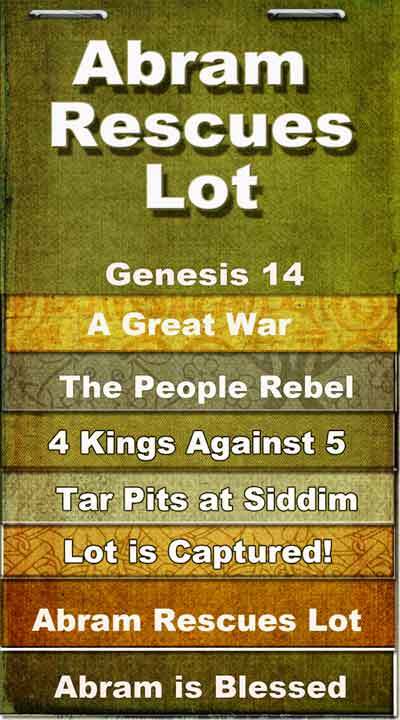 And Abram gave him one-tenth of everything. Let’s Pray: Lord, give us the conviction to ever follow You; help to say no to any pursuits or possessions that does not come from you. Help us to live for You always. Amen. Admah, King Shemeber of Zeboiim, and the king of Bela (that is, Zoar). 3 All these joined forces in the Valley of Siddim (that is, the Dead Sea). 4 Twelve years they had served Chedorlaomer, but in the thirteenth year they rebelled. 7 then they turned back and came to Enmishpat (that is, Kadesh), and subdued all the country of the Amalekites, and also the Amorites who lived in Hazazon-tamar. Ellasar, four kings against five. 10 Now the Valley of Siddim was full of bitumen pits; and as the kings of Sodom and Gomorrah fled, some fell into them, and the rest fled to the hill country. 12 they also took Lot, the son of Abram’s brother, who lived in Sodom, and his goods, and departed. 13 Then one who had escaped came and told Abram the Hebrew, who was living by the oaks of Mamre the Amorite, brother of Eshcol and of Aner; these were allies of Abram. 14 When Abram heard that his nephew had been taken captive, he led forth his trained men, born in his house, three hundred eighteen of them, and went in pursuit as far as Dan. 15 He divided his forces against them by night, he and his servants, and routed them and pursued them to Hobah, north of Damascus. 16 Then he brought back all the goods, and also brought back his nephew Lot with his goods, and the women and the people. 17 After his return from the defeat of Chedorlaomer and the kings who were with him, the king of Sodom went out to meet him at the Valley of Shaveh (that is, the King’s Valley). 18 And King Melchizedek of Salem brought out bread and wine; he was priest of God Most High. 1) Does God already have a clear teaching about this? If God has already spoken clearly about this, you do not have to wonder any longer. Just do what he has told you. So, I would encourage you to saturate your mind as much as possible with God’s Word. Read it. Study it. Memorize it. Learn it. 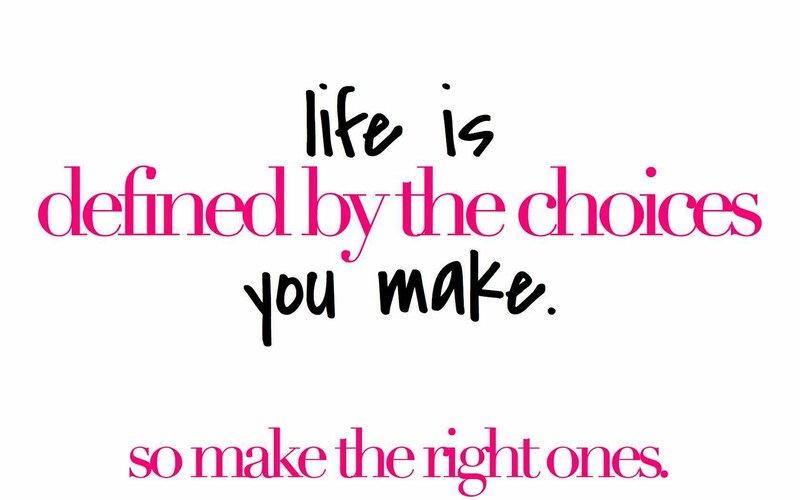 Once you have done so, you will be amazed at how much better you are at making good, solid decisions in life. 2) What do my top spiritual advisors tell me about this? Where there is no counsel, the people fall; but in the multitude of counselors there is safety. It is vital that you surround yourself with godly friends who will be able to speak into your life about life’s decisions. Do you realize that you are basically a composite of the five people you spend the most time with? It is crucial to choose those people carefully. If you don’t have those types of friends, I would encourage you to increase your involvement in church and small groups and ministry in order to establish those godly relationships. 3) What do authority figures in my life have to say about this? Remind them to be subject to rulers and authorities, to obey, to be ready for every good work. God often works through authority relationships in our lives. For instance, it would be extremely rare for the best choice to be something that is illegal. Look at this choice from the vantage point of authority figures in your life, and at least use that as an important reference point for you. 4) How will this affect me spiritually? All things are lawful for me, but not all things are helpful; all things are lawful for me, but not all things edify. There is much more to this life than just earning a bigger paycheck or improving your status amongst peers. When you make choices, make sure you consider how this decision will affect your spiritual development. Will this draw you nearer to God or further from him? Will this decision interfere with your ability to attend church, maintain godly relationships, or spend time cultivating your spiritual disciplines? If it harms you spiritually, then I would suggest pulling the plug on that choice. 5) How will this affect my family? Will this draw us closer to God or further from God? But beware lest somehow this liberty of yours become a stumbling block to those who are weak. Not only must you consider how this decision will affect your own spiritual development, but you must also consider the affects it will have on the spiritual state of your family. Will this help your family to grow in Christ, or will it interfere with that spiritual growth? Will this pull them away from godly friends and away from a healthy, godly church environment? Will this divide your family in any way? Be careful not to make decisions that will cause your family to pay a big price. 6) Is this going to bring more peace or less peace to my life? That you also aspire to lead a quiet life, to mind your own business, and to work with your own hands, as we commanded you. Did you know that God actually wants you to have a peaceful life? Of course, this is not the “American way,” but it is definitely an important consideration when it comes to making decisions. Be cautious that you are not stacking your life with more and more “stuff” that will send you over the edge with stress and anxiety. And make sure it is not going to steal the peace from your family as well. 7) Is this consistent with the way God has wired me? God has created you for a purpose, and He has designed you specifically to fulfill that purpose. You are a gifted individual, and His plan will be for you to function within that area of giftedness. When we veer outside of the way He has wired us, we often feel excessive stress, anxiety, and burnout very quickly. When it comes to making decisions, make sure you evaluate the choice in light of the way that God has designed you. Are you creative? Are you detail-oriented? Are you relational? Are you task-oriented? Are you a communicator? Pay attention to how God has wired you. 8) Am I paying attention to the risks that are associated with this? A wise man foresees evil and hides himself; the simple pass on and are punished. 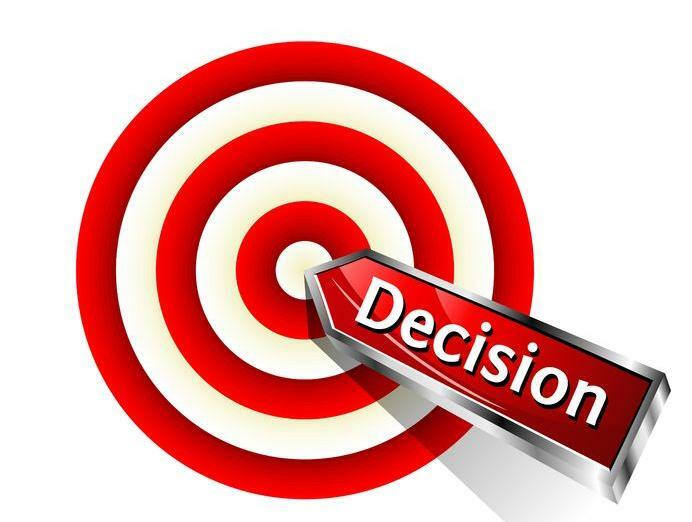 When making decisions, it is very important to honestly assess the risk that is involved. Sometimes we can become so mesmerized by a “golden carrot” that we overlook the risks that are associated. For this one, I would suggest that you have an outside voice speak into the situation. In his book Entreleadership, Dave Ramsey says that anytime he has made a business decision that has gone against his wife’s advice, it has cost him at least $10,000. Sometimes others, like a spouse, can see the risks that we overlook. It is a sign of wisdom to be cautious. Not fearful, but cautious. 9) Do I have total peace from God about this? Sometimes everything can look right on the outside when I’m making a decision, but there will still be angst within my spirit. I have learned that making a decision without that inner peace is nearly always a mistake. God gives us peace as a protection and a guide. Seek His peace, and be cautious of making decisions that move against that peace. 10) Are the doors of circumstances clearly open here? God often works through obvious circumstances. For example, He did that for Paul in Acts 16. In that chapter, Paul and his entourage kept facing closed doors as they were seeking where they were to minister next. And then, one door to Asia flew open while all other doors were closing. God often directs me more by closing doors than by opening them. But there have been times in my life when I have attempted to force open a door that was not truly open. That never ends well. It’s always good to look at how God is opening or closing doors in front of you. And while an open door does not always mean that you are to pass through, it is often an indicator that God is at work. Pay attention to open doors, and be cautious of forcing doors open when they are closed. 11) Is now the best time for this? Could waiting be better? Redeeming the time, because the days are evil. Therefore do not be unwise, but understand what the will of the Lord is. Haste does not always produce the best decisions. 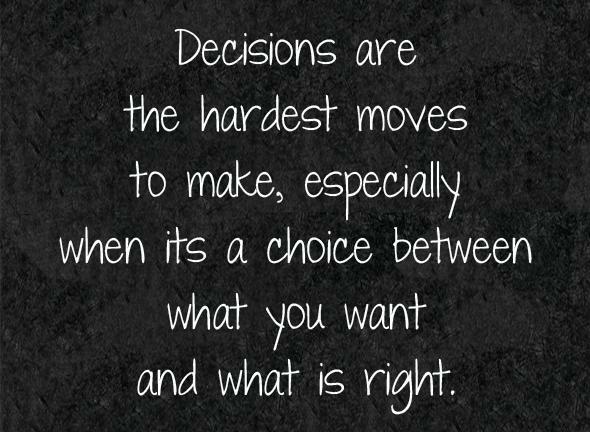 Sometimes everything might seem right about a choice, but making the decision at a later time might make more sense. This isn’t always easy, because we often want to move forward quickly when we see an opportunity. But sometimes the wiser decision is to slow down, plan more, get more input, and give it more time to develop. 12) Am I willing to let God close this door? An important element to making good decisions is to make sure that you are completely submitted to God’s ultimate plan for your life. Sometimes we get it into our heads that we want to do a certain thing, and then we struggle immensely when we begin to realize that God may not want us to move forward with that particular choice. The disaster comes when we place our desire above God’s plan. Let me be clear here. That never turns out well. The best decision you can ever make is to submit your choices to God’s plan and be willing to give up an opportunity when you sense God does not want you to move forward with that decision. 13) Am I willing to trust God if He asks me to step forward? Are you willing to do that thing He might want you to do? What if it makes you feel uncomfortable? What if it moves you out of your comfort zone? What if it requires faith? I can testify to you that the most exciting moments of my life have been when I have submitted to God and stepped forward with Him in faith. I hope you can experience that same joy. OK, so when you have a tough choice to make go over these questions before confirming your decision. Talk through each of these questions with your spouse or a friend in the context of a decision you are currently making in your own life. All Scripture quotes are taken from the New King James Version of the Bible. Confidence in God’s grace and care. – “The Lord is my shepherd.” In these words, the believer is taught to express his satisfaction in the care of the great Pastor of the universe, the Redeemer and Preserver of men. With joy he reflects that he has a shepherd, and that shepherd is Jehovah. 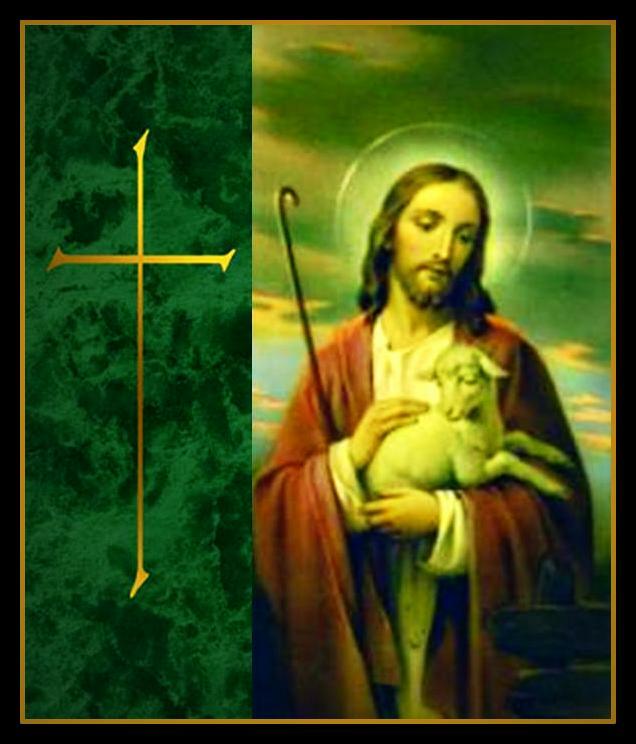 A flock of sheep, gentle and harmless, feeding in verdant pastures, under the care of a skillful, watchful, and tender shepherd, forms an emblem of believers brought back to the Shepherd of their souls. The greatest abundance is but a dry pasture to a wicked man, who relishes in it only what pleases the senses; but to a godly man, who by faith tastes the goodness of God in all his enjoyments, though he has but little of the world, it is a green pasture. The Lord gives quiet and contentment in the mind, whatever the lot is. Are we blessed with the green pastures of the ordinances, let us not think it enough to pass through them, but let us abide in them. The consolations of the Holy Spirit are the still waters by which the saints are led; the streams which flow from the Fountain of living waters. Those only are led by the still waters of comfort, who walk in the paths of righteousness. The way of duty is the truly pleasant way. The work of righteousness in peace. In these paths we cannot walk, unless. God lead us into them, and lead us on in them.Discontent and distrust proceed from unbelief; an unsteady walk is the consequence: let us then simply trust our Shepherd’s care, and hearken to his voice. The valley of the shadow of death may denote the most severe and terrible affliction, or dark dispensation of providence, that the psalmist ever could come under. Between the part of the flock on earth and that which is gone to heaven, death lies like a dark valley that must be passed in going from one to the other. But even in this there are words which lessen the terror. It is but the shadow of death: the shadow of a serpent will not sting, nor the shadow of a sword kill. It is a valley, deep indeed, and dark, and miry; but valleys are often fruitful, and so is death itself fruitful of comforts to God’s people. It is a walk through it: they shall not be lost in this valley, but get safe to the mountain on the other side. Death is a king of terrors, but not to the sheep of Christ. When they come to die, God will rebuke the enemy; he will guide them with his rod, and sustain them with his staff. There is enough in the gospel to comfort the saints when dying, and underneath them are the everlasting arms. The Lord’s people feast at his table, upon the provisions of his love. Satan and wicked men are not able to destroy their comforts, while they are anointed with the Holy Spirit, and drink of the cup of salvation which is ever full. Past experience teaches believers to trust that the goodness and mercy of God will follow them all the days of their lives, and it is their desire and determination, to seek their happiness in the service of God here, and they hope to enjoy his love for ever in heaven. While here, the Lord can make any situation pleasant, by the anointing of his Spirit and the joys of his salvation. But those that would be satisfied with the blessings of his house, must keep close to the duties of it.